Then we reflected on the reading about “Upside-Down Teaching,” and brainstormed ways to shift from I-We-You approaches to You-We-I approaches. We had time to plan for this shift by looking at curricular materials and plans for the first few weeks of school. We watched a video of the “My favorite no” practice. We ate a delicious lunch together and some of us said good-bye to Fran. Sadface. After lunch, Melina shared recommendations for the OGAP frameworks. Thanks, Melina! We resumed work on operations with fractions. This time we pushed ourselves to develop even deeper understandings of the “invert and multiply” procedure. 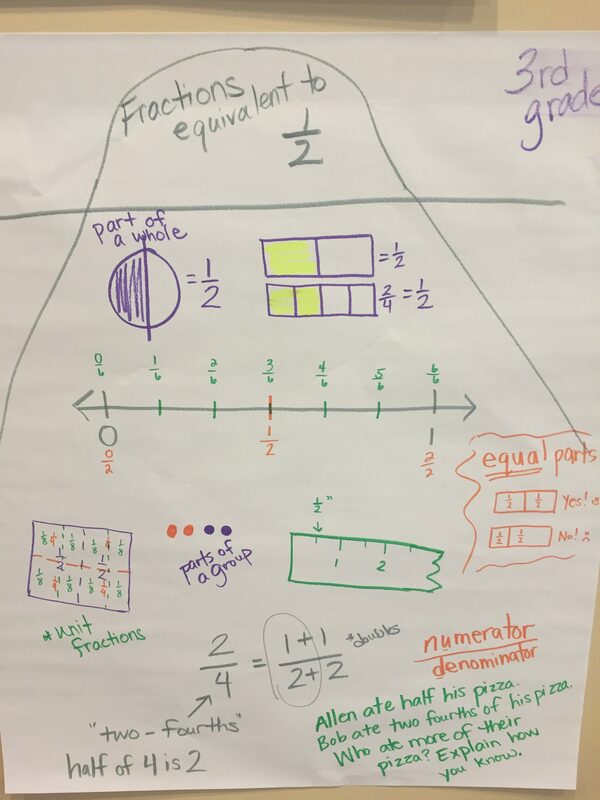 This entry was posted in Daily Blog Recaps, Math as a Second Language on July 20, 2018 by Andrea McCloskey. We started with introductions, along with welcome messages from Mark Levi and George Andrews. We briefly touched on connections between these, and will return to that later. We spent the rest of the morning on the pre-test and then participants got a chance to share their backgrounds and start networking before lunch. 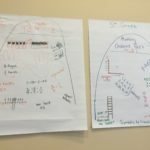 Strands of Mathematical Proficiency: What does it mean to know mathematics? Here are the definitions of the Strands of Mathematical Proficiency that were in the PowerPoint today:Adding it Up: Helping Children Learn Mathematics, National Research Council (2001, p. 116). Conceptual Understanding – comprehension of mathematical concepts, operations, and relations. Procedural Fluency – skill in carrying out procedures flexibly, accurately, efficiently, and appropriately. Adaptive Reasoning – capacity for logical thought, reflection, explanation, and justification. Strategic Competence – ability to formulate, represent, and solve mathematical problems. Productive Disposition – habitual inclination to see mathematics as sensible, useful, and worthwhile, coupled with a belief in diligence and one’s own efficacy. 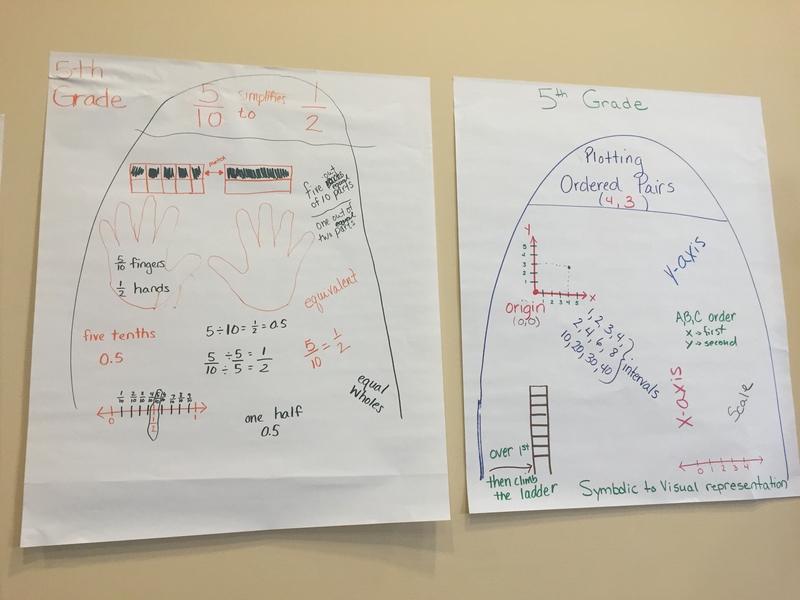 Standards for Mathematical Practices: What kinds of activities should students engage in while learning mathematics? These are listed in Principles to Actions and defined on in your notebook in the front matter section on page 5. 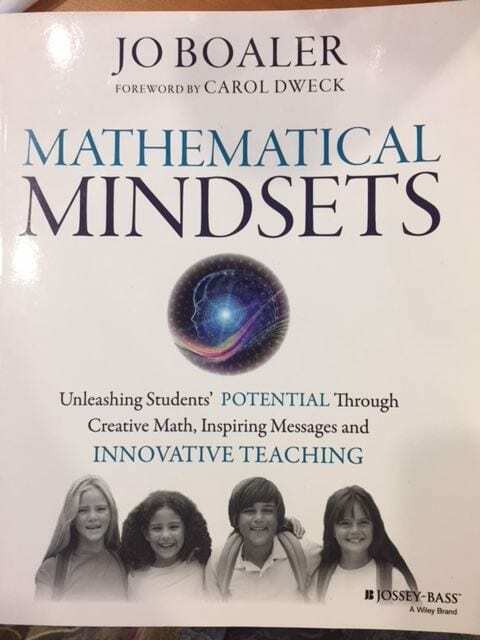 Eight Teaching Practices: How should teachers teach so that students engage in learning mathematics so that they become mathematical proficient? This is the main content of Principles to Actions: Ensuring Mathematical Success for All. We will unpack several of these teaching practices over the two weeks! We ended the day with a discussion of the “Adjective Noun Theme,” which is based on the notion that numbers are most useful when they are considered with context. Numbers are adjectives describe the amount of some noun. We then tried to apply this viewpoint to compare similar fractions, treating the denominator as a noun and the numerator as an adjective. Refer to “Rules that Expire” (Block 1, p. 15 of notebook). For your assigned rules, follow the instructions on the sheet. What did you learn from reading the “Progress and Change” section about the state of mathematics education in the U.S.? Write a couple of thoughts in your notebook. Think about: How did you react to the chart of beliefs on page 11? In your notebook, write a reflective response (a few sentences) to the beliefs chart. 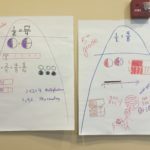 This entry was posted in Daily Blog Recaps, Math as a Second Language on July 16, 2018 by Andrew Baxter. It’s hard to believe our week is almost over. Read: Principles to Actions sections on “Facilitate Meaningful Mathematical Discourse” and “Pose Purposeful Questions,” pages 29-41. Do: “Problems on Division” Block 3, Page 37. Problems 3 and 4. This entry was posted in Daily Blog Recaps, Math as a Second Language on June 29, 2017 by Andrew Baxter. We are off to a great start for PMI at Berks. We have 22 participants from 7 districts, with every grade level from Kindergarten to 6th represented. Read Principles to Actions pages 1-11 and pages 17-24. Reflect on a task you have assigned your class, and analyze it from the perspective of what level of cognitive demand it makes. Choose 3 categories from the “Spectrum of Subtraction” in Block 2, Page 9. For each one, write a word problem appropriate for your grade level. We will share these on Tuesday. Complete both “Addition and Subtraction Problems” on Block 2, Page 10. This entry was posted in Daily Blog Recaps, Math as a Second Language on June 26, 2017 by Andrew Baxter. We began by reviewing the homework. Different tables discussed different problems, and we had some good back-and-forth about factoring and dividing to one. Fran highlighted how a bit part of algebra success is recognizing certain features such as common factors. Five minutes means five minutes. 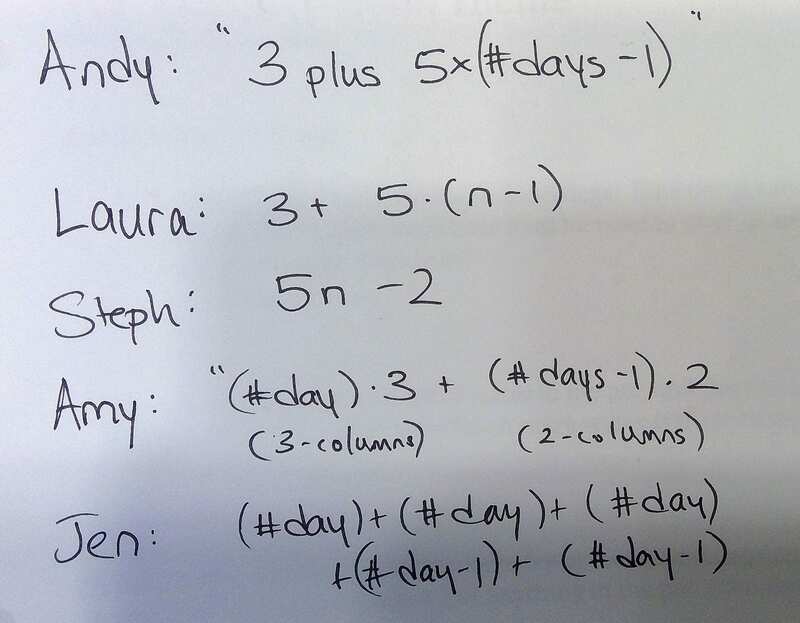 Working in a group helps learn math. Be a good group member. Create a safe environment for students. Multiple approaches to solving math problems are valued. Teachers said “explain your answer” whether or not the answer is right or wrong. We got a group picture, which will be posted soon. We began our discussion about fraction addition and subtraction, starting with length-based models and how that can support what sums of (positive) fractions should be. We repeated (frequently) about how our different models of fractions can grant different insights into the arithmetic. For example, length-based models demonstrate what the sum should be, and finding an appropriate way to measure that length brings about a common denominator. Fraction models based on amount-of-pieces (e.g., slices of pizza) can present a hurdle (which can be overcome) when the sum is more than one. Viewing fractions as proportions (i.e. seeing 1/2 as one out of every two) is ill-suited for adding fractions. A ribbon is 4/5 feet long, and is cut into 3 equal-length pieces. How long would 2 of them be? We found that #1, based on repeated addition, is ill-suited for multiplication when neither is a whole number. Option #3 isn’t much better, at least as far as intuition-building. Models 2 and 4 were most convincing. We spent the rest of the morning discussing our area models for #2, progressing to other examples, one where one factor is greater than one, and another where the product is greater than one. The area model reinforced how the numerator of a fraction is an amount of pieces while the denominator describes how small the pieces are. We wrapped up the discussion of fraction multiplication by briefly exploring interpretation #4 above and cutting a fractional length into equal pieces. That problem reinforced the “2/3 is two pieces of size 1/3” viewpoint. We also briefly discussed why mixed number multiplication can be problematic. After eating lunch together, we resumed our discussion of fraction division. We drew pictures, compared models, and learned about the common denominator method! 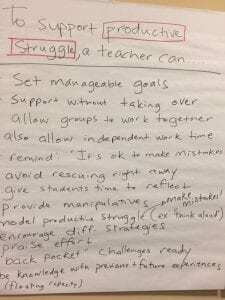 We then picked up our work with our grade-level colleagues and looked for more high-level tasks and plan for supporting productive struggle. We concluded our day by reflecting on our take-away messages and saying good-bye to some of our colleagues. It’s been a busy but fun week! Enjoy the weekend, and come back refreshed on Monday morning. 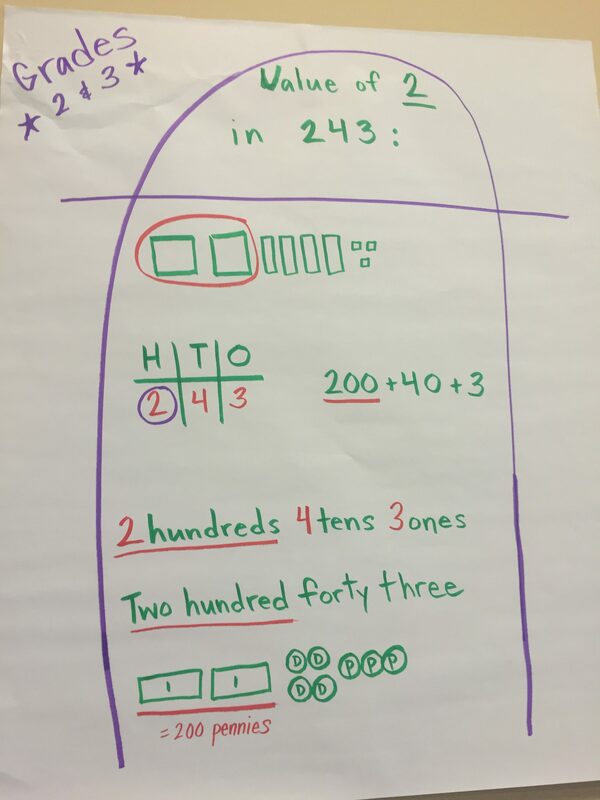 This entry was posted in Daily Blog Recaps, Math as a Second Language on July 22, 2016 by Andrea McCloskey. We began the morning with “Rules that Expire” – we had 10 rules and groups of teachers made a presentation about their particular rule that expires. All of the rules came from an article published in Teaching Children Mathematics titled “13 Rules that Expire,” which we gave to each teacher. We revisited the why of (Negative)x(Negative)=(Positive). Andrew shared two arguments (one from Matt), Fran shared a third, and Hope opened the discussion to introduce a fourth. These four arguments were all based on the principle that arithmetic needs to be consistent, rather than cute analogies or contrived scenarios. We next moved into discussing division, starting with “walking back” the concept of how division is treated in fifth grade and then working grade-by-grade back to Kindergarten. We found how the seeds of division are planted as early as Kindergarten. We based our understanding of division on “unmultiplication,” specifically how any division calculation can be seen as filling in a missing factor for a multiplication sentence. This perspective allows us to leverage our models of multiplication to inform how we view division. 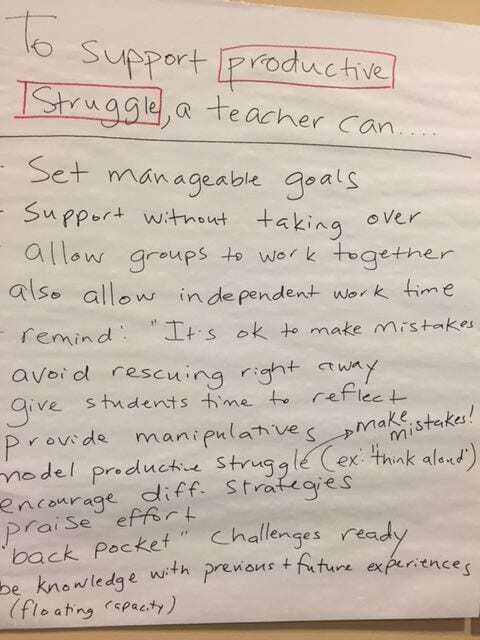 We then split up by grade level and found (or created) a task that requires a high level of cognitive demand and began to plan for implementation, with a specific focus on supporting productive struggle. We discussed how multiplication can be seen in conjunction with rates, such as how paying 2 dollars/hour for 3 hours of parking costs $6 since 2×3=6. Going the opposite direction, paying $6 for 3 hours of parking means that the rate was 2 dollars/hour since 6÷3=2. Rates play a fundamental role in grades 6, 7, and beyond. We next moved into a discussion of how participants teach fractions and how they themselves understand them. 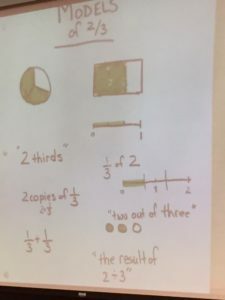 We found myriad ways to represent a fraction as simple as 2/3 (see Andrew’s summary image below), but also found representations like “2 out of 3” to be limited when moving to improper fractions like 5/3. Other models, and especially the number line model, work just as well for proper fractions as for improper fractions. As a community, we have focused on establishing a number of norms (ways of working) this week. We have also focused on a few messages about the learning and teaching of mathematics. Please respond to the following prompts from your perspective as a PMI workshop participant. There are no right or wrong answers to these prompts – we want you to respond from your perspective. Briefly describe three (3) different norms that we have established about participating in the workshop activities. Briefly describe two (2) different norms we have established about being a productive group member. 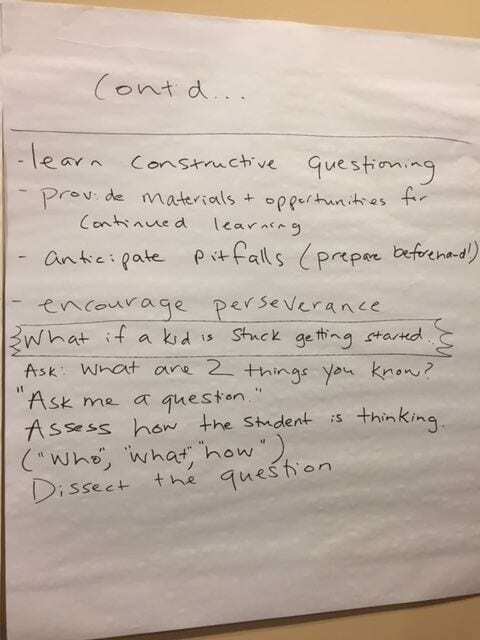 Briefly describe two (2) messages that you have taken from the workshop (thus far) about what it means to “know” and “do” math. Briefly describe two (2) messages that you have taken from the workshop (thus far) about teaching math. This entry was posted in Daily Blog Recaps, Math as a Second Language on July 21, 2016 by Andrew Baxter. Then we continued yesterday’s discussion on addition and subtraction of signed numbers, and we began our consideration of multiplication. What IS multiplication, anyway? Turns out: it is repeated addition, but it’s a lot of other things too! We were able to enjoy some beautiful weather during our lunch break. 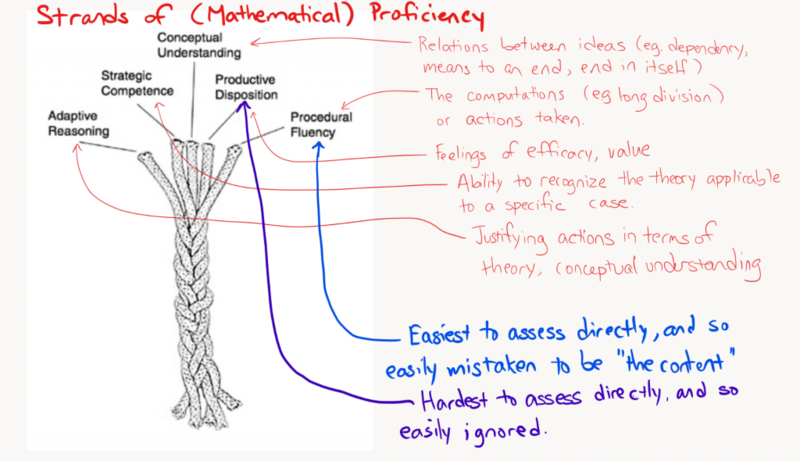 Upon return, we discussed conceptual understanding and procedural fluency and how these two dimensions of mathematical proficiency can complement one another. We applied ideas from the “iceberg” article to construct our own gallery of posters. 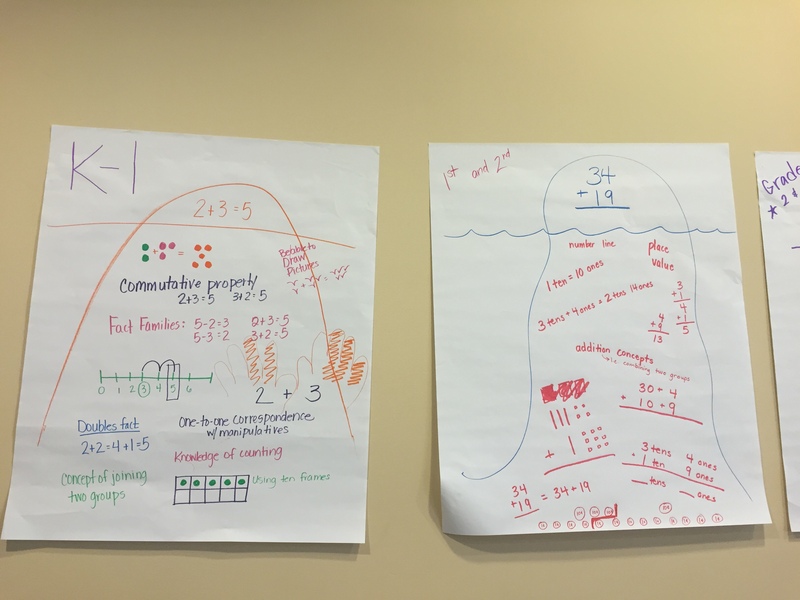 These posters let us illustrate the conceptual understandings that lend “floating capacity” to the “icebergs” of mathematical procedures. The posters look great and contain many important ideas. See pictures below. Finally we extended our discussion of multiplication to consider how the distributive property lays out the relationship between addition and multiplication. We also saw how factoring common terms, such as (6+15)=3*(2+5), is only the distributive rule in reverse. Problem 9 on page 4.7 (area of a staircase). (The area is not 32). If problem 9 was easy for you, do 10. Problem 7 on page 4.23 (multiplying by 9 trick). 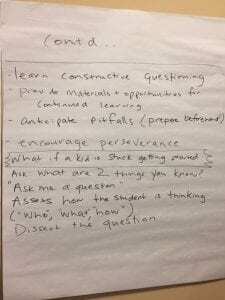 Review the “Beliefs about teaching and learning mathematics” chart (p. 11, Obstacles). What beliefs are evident in Ms. Flahive’s and Ms. Ramirez’s classrooms (see fig. 21 on page 51)? What impact do those beliefs have on students’ opportunities to grapple with the mathematical ideas and relationships in the problem? 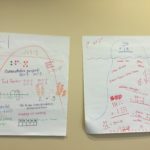 This entry was posted in Daily Blog Recaps, Math as a Second Language on July 20, 2016 by Andrea McCloskey. This has been an exciting first day! We started with the usual introductions, where you were greeted by Andrew Baxter, George Andrews, Yuxi Zheng, Matt Katz, Andrea McCloskey, and Fran Arbaugh. We talked about expectations and our objectives for this week, and then dove into the Kayak Problem. There is more than one way to solve a problem, although often the ways to solve are related. Here we saw a list of +2s and +4s to represent the hours, a organized chart, an algebraic formula, and a graphical representation. There are advantages and disadvantages of these different methods, as some solutions make certain subtleties and patterns clearer than others. Ultimately students should develop proficiency in the efficient methods, but there is danger in knowing only those methods at the exclusion of mathematical understanding. After a break, the participants took a pre-assessment. This was followed by a lunch hour. 2. 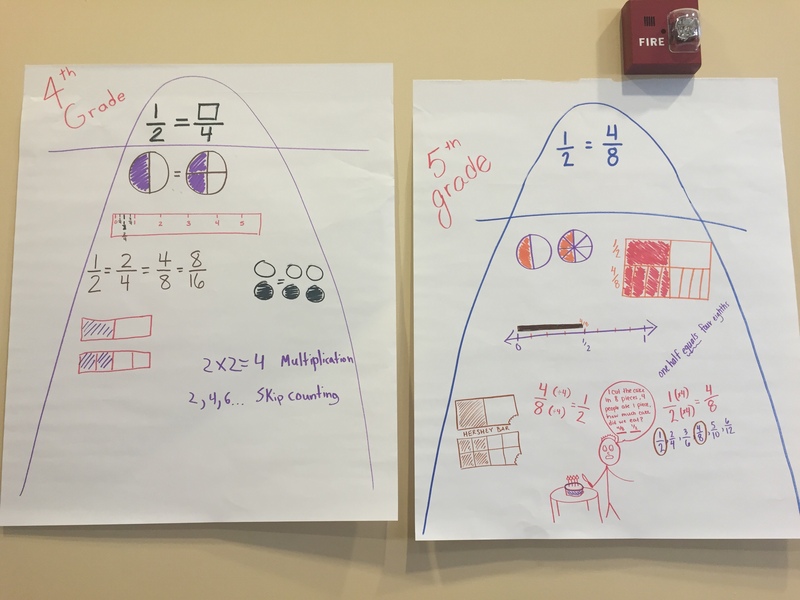 What kind of activity do students need to engage in to become mathematically proficient? We will draw on CCSS-M Standards for Mathematical Practice (found on page 8 of Principles to Action). 3. What kind of teaching practices support students to engage in the SMPs and become mathematically proficient? We will draw on the content of Principles to Action. Next Matt kicked off Unit 2 on the Adjective-Noun Theme and Addition. We saw how in arithmetic situations, numbers are adjectives and we often omit (or forget) about the nouns. This can shed light on why our standard algorithm for addition works as it does, as well as give insight into why fractions need common denominators when adding and subtracting. HOMEWORK: One clarification: homework is not collected and graded or for anything other than deepening and solidifying your own learning. Homework problems are discussed the following day. Page 1.5, Variations on the Kayak Problem. Solve problems 3 and 4. One you solved it one way, seek out another way to solve it. Page 2.11, number 7. Woodchuck Valley Tennis Association Trophies. Make an attempt, although we will look at this in class in the morning. Read Principles to Action: Sections titled Progress and Change; Effective Teaching & Learning (Pages 1-12) and section titled “Implement Tasks that Promote Reasoning and Problem Solving” (pages 17-24). Reflect on a typical in-class math lesson (use your textbook to refresh your memory). Using the descriptions of Levels of Cognitive Demand in Figure 3 (p. 18), describe the types of mathematical thinking your students are required to engage in during a typical lesson. Reflect on a typical homework assignment that your students complete (use your textbook to refresh your memory). What level of cognitive demand do most of the tasks on a typical homework require of your students? This entry was posted in Daily Blog Recaps, Math as a Second Language on July 18, 2016 by Andrew Baxter. We started Day 2 with Andrea leading a discussion of the burning questions from the day before, such as “How might ideas from Day 1, like understanding mathematical concepts as adjectives or nouns, play out in our classroom?” We then moved to a review of Day 1’s math homework. Teachers found a partner within their grade band (K-2, 3-4, or 5-8) to compare and contrast their solutions to the Film Problem. 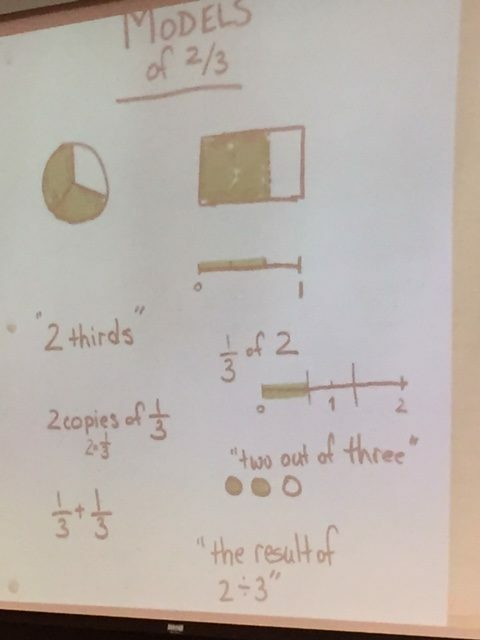 When we started the whole-group debriefing of the math homework, Fran asked the participants to show her, with thumbs up or thumbs down, if they were satisfied with their understandings of #1 and #2 based on their small group work. Seeing that everyone was satisfied, Fran stated the she was not going to do a whole-group review of the solution to the problems (no need since everyone was good with their solution). Fran then asked if everyone was good with a solution to #3 and saw that there was some hesitation. A number of teachers shared their solutions to #3 (using different representations: tables of values, equations/expressions, graph). Fran then asked people who were not satisfied with their solutions to #4 and #5 to work further on those problems, using the new knowledge that they had built during this session. What ideas about expressions, equations, and multiple representations were involved with the hw problem? How do similar ideas play out in your grade band? We then moved onto small-group discussions of the pedagogy homework. Teachers shared curriculum materials in their groups and discussed the math tasks in their curriculum through a cognitive demand lens. Fran and Andrea ended this session with some whole-group discussion of cognitive demand, sharing information about the QUASAR project and how cognitive demand might be a useful lens to use with textbook adoption groups. We spent the rest of the morning discussion how counters can inform our understanding of numbers and addition. We used geometry to gain a new view of even and odd numbers in terms of stacks of 2, and extended those ideas to looking at remainders when numbers are divided by numbers other than 2. After lunch we tackled the “100 days of Christmas” problem, which led to a lot of fruitful discussions. There is a summary of many of the arguments made in class (and others) at http://betterexplained.com/articles/techniques-for-adding-the-numbers-1-to-100/. We next began our discussion of subtraction by basing it on the missing-addend form of addition. Nola shared how students at the end of first grade are already seeing addition with missing addends, which sets up subtraction. We then moved into multiple models of subtraction, both in terms of counters and a number line, eventually settling on distance as a view that will be most flexible. We also began to explore what the adjective-noun theme has to say about subtraction. 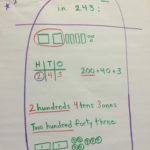 The short version is that it works the same as addition, which isn’t surprising considering the deep connection between subtract and addition.. We also considered alternate algorithms for multi-digit subtraction as a test of our understanding of how place value interacts with subtraction. Read Principles to Action: Section titled “Build Procedural Fluency from Conceptual Understanding” (p. 42-48). Identify a procedure or skill that you consider essential for students at your grade level to learn. Describe the conceptual understandings that support students’ learning of the procedure or skill. Write questions you have based on the 2 readings. The group that wrote the Common Core Standards are also writing documents detailing how certain ideas progress across grade levels. These are currently in draft form, but are usable. Drafts are available at http://ime.math.arizona.edu/progressions/. A table summarizing the various combinations of given and missing terms in an addition or subtraction problem appears on page 7 of the K-5 Progression on Counting and Cardinality and Operations and Algebraic Thinking. The Online Etymological Dictionary. etymonline.com A searchable general-purpose etymology dictionary. My wife and I visit this site at least twice a week. 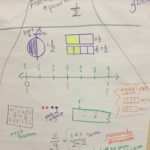 This entry was posted in Daily Blog Recaps, Math as a Second Language and tagged blog recap on July 21, 2015 by Fran Arbaugh.